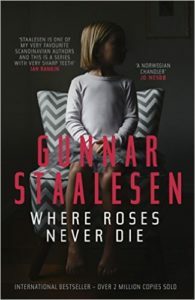 A huge thanks to the absolutely wonderful Karen Sullivan of Orenda Books for Claire’s copy of this stunning book by Gunnar Staalesen. I have seen some superb reviews for this book and I am definitely looking forward to reading it. I am also totally in love with the cover….wow! So I won’t keep you waiting any longer #bookjunkies….over to Claire for her thoughts on Where Roses Never Die. Where Roses Never Die is the 16th Varg Veum novel but this is the first I’ve read – in fact it’s the first proper Scandi-crime novel I’ve read! I know some people who are currently giving me a virtual slap for that comment! But you’ll be pleased to know I’m sold! I’ve got a few Scandi-crime books sat patiently waiting on my kindle so I’ll try not to put off reading them for too long. I loved seeing the Norwegian letters ø and å scattered through the novel. Admittedly I have no idea how the place names are pronounced that they feature in. I don’t know if it’s a Norwegian saying or something the author has created but the phrase “My mouth was as dry as a school sponge at the end of the school holidays” really stood out to me. It gives a great image as to the thirst of Veum both for fluid and for something stronger. At points I felt the book was reminiscent of Six Four by Hideo Yokoyama; this could possibly down to the similar story of a historic child disappearance, or that’s because it’s translated it’s in a more “proper” version of English than I normally read. The author definitely keeps you guessing; what does an armed robbery linked with the old case of the disappearance of a young girl?? Veum is drawn into both investigations unable to separate off the armed robbery from his mission of uncovering the truth about the disappearance. A huge thank you to Karen Sullivan at Orenda Books for sending me a copy of Where Roses Never Die. I well and truly popped my Scandi-crime cherry with this fabulous book! Thanks for the great review Claire and for once again adding to my growing TBR! Click the link below if you are keen on a bit of #ScandiCrime! This entry was posted in Guest Reviews by crimebookjunkie. Bookmark the permalink.